ALLEVYN Adhesive Hydrocellular Dressing is a foam dressing that has a highly absorbent central hydrocellular layer. The perforated wound contact layer is held in place by a low allergy adhesive. It also features a waterproof outer film layer. ALLEVYN Hydrocellular dressings in an adhesive format for simple and effective fixation. It features tapered construction with micro-thin edges. The wound contact layer of ALLEVYN Adhesive is coated with a low allergy adhesive which is designed to adhere well to intact skin, but not to wounds. The adhesive is non-irritating. -The result is the formation of a wound environment, which allows wound closure to progress without the need for frequent dressing changes. ALLEVYN Adhesive creates and maintains a moist wound healing environment at the wound surface, helping prevent eschar formation. ALLEVYN Adhesive has a profiled cross-section, narrowing to micro-thin edges which helps ensure the dressing remains securely in place and prevents accidental removal by friction between the dressing and clothes and bedding. It is waterproof which aids in the prevention of bacterial contamination. ALLEVYN Adhesive is indicated for exudate absorption and the management of partial to full thickness wounds. Some typical wounds are ulcers (venous, arterial, diabetic), pressure sores, donor sites, surgical incisions, surgical excisions, burns (1st and 2nd degree). It provides physical separation between the wound and external environments to assist in preventing bacterial contamination of the wound. -Select and appropriate size dressing. Prepare and clean the skin aound the wound. Skin-pPrep Protective Wipes may be used to protect fragile skin. Peel back the protective papers and anchor the dressing over the wound. Smooth the dressing into place, ensuring that the edges of the dressing are not wrinkled. 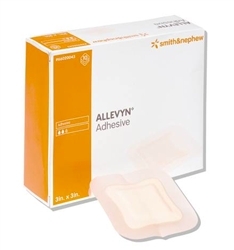 -During the early stages of treatment, Allyven Adhesive should be inspected frequently; dressings can be left in place until exudate can be seen through the outer waterproof film layer and approaches 3/4" from the edge of the dressing. -To remove, lift one corner of the dressing and lift it gently away from the wound. -Do not use any ALLEVYN product with oxidizing agents such as hypochlorite solutions (eg Dakins) or hydrogen peroxide, as these can break down the absorbent polyurethane component of the dressings. -As with all adhesive products, some cases of irritation and/or maceration of the skin surrounding the wound have been reported. -It should be noted that too frequent dressing changes, particularly on patients with fragile skin, may result in skin stripping. -If reddening or sensitization occur, discontinue use and consult a healthcare professional. -ALLEVYN Adhesive is not indicated for use on third degree burns.